Hours per week spent on social media: I never really track this because I don’t time-block for social media. I use it throughout my day to keep in touch, network, and stay up-to-date on industry news. You can most frequently find me on Facebook and Instagram because that’s where I can have some really great interactions, but I don’t discriminate. I spend a lot of time browsing Twitter, too, and get a ton of content and news from there. I have 1,164 Facebook friends, 1,090 Twitter followers and 465 Instagram followers. I genuinely don’t care. I had to go look it up on all my accounts to even answer the previous question. Social media to me is just that — a medium to be social. I don’t use social media for status or recognition; I use it to easily connect with people. I’m an inherently social person, so I love ways to be social — in person or online. I’ve never paid attention to numbers because I’m not trying to influence anyone, I’m just trying to have conversations with people who are friends offline, too. Totally. It’s hard, though. I try to unplug a little every day and I’m even getting pretty good at it. I also never leave my phone in sight when I’m having a conversation with someone. My face-to-face time is always more meaningful to me than my clicks on a keyboard. That will never change. Social to me was always just a way to have more meaningful relationships, but the best way to do that was face to face. I would trade my social media accounts for more face-to-face time any day. Does social help your business? If so, how? I don’t really have goals for social other than to be social. All forms of social media are just mediums for me to connect with people. More meaningful connections is always my goal. I don’t really have a strategy other than being myself. Is social media worth it? I suppose that depends. Door-knocking isn’t for every agent, and neither is social media. The key that I have always found is to do things that you would do even if you knew no business might come from it. Be yourself. When you can be your true self, it is always worth it, isn’t it? I don’t know that this qualifies as crazy, but it was definitely impactful. At Real Estate Connect New York 2013, my friend Michele Serro spoke about her product, Doorsteps. I couldn’t attend the conference in person, so I was following Twitter closely. I didn’t know Michele at the time but was completely taken with her story and her product. I made a point to connect with Michele on social media, and a week later, we were having a Google Hangout where I was telling her how much I liked the product and had started using it with my clients. I didn’t meet Michele in person until Real Estate Connect San Francisco 2013 that July. By that point, we had become good friends, and she is an important mentor of mine to this day. I never would have met Michele without social, and I definitely wouldn’t be where I am today without her. I think the reason why my actions on social resonate with so many people is that I’m never operating as a business on social. Sure, as real estate agents, we’re businesses— but we’re people, too. I’ve never been shy about who I am, what I think and what I want to say. I think that people dig that, and if they don’t … well, they probably aren’t connecting with me in person, either. That’s OK. I’m certainly not for everyone. Social is a way to have a conversation, so I might as well speak as myself. It is always about social. Business is the icing on the cake. Part of why I love this business is that I get to spend my days speaking to so many different people and hearing their stories. My business is social, so social media makes sense, but that has never been why I use it. Facebook was just catching on when I was in college. I remember being on the university-run network back in college, then it grew to become The Facebook. I was an early adopter, so when I got into the real estate business, social media wasn’t really a choice — it was a continuation of previous actions. How do you monitor the channels? 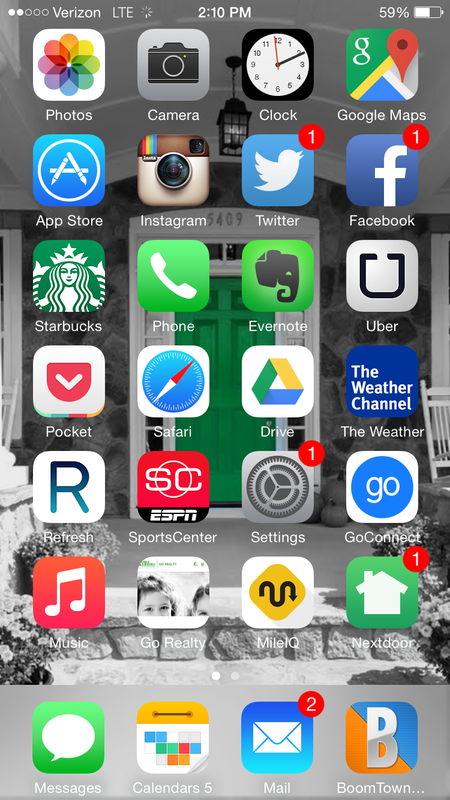 Do you use software or apps to manage your account, and which ones? I just have push notifications. Sometimes, things get out of hand and I’ll turn off notifications, but them coming to my phone gets the job done. No, but I will. Whenever I stop enjoying what I’m doing, I do something else. That time will come for social media eventually. Not at all. I don’t want to be, either. I do this for myself, not to influence others. My dad used to say, “This girl would talk to a brick wall if it would listen.” I always joked that I would eventually get bored with that, though, because the brick wall doesn’t talk back. I love sparking conversation and learning about people. I ask everyone’s name; I know the importance of a good handshake; and I love hearing about stories outside of real estate. This is the bedrock of successful people. They know how to connect beyond just business and develop personal relationships. This isn’t a time commitment; it is how I live my life. It isn’t a task or a to-do on a list, it is a lifestyle choice I make to be social. How do you leverage your prominence on social? Whom do you follow, why? My friends and family are my main source for social media activity. I also follow a lot of industry professionals, some of whom I know, and some whom I have just grown to respect their work. Following these folks has allowed me to grow as a professional and push or elevate my thinking. I’m learning from a network outside of my market and across the country and around the globe, which gives me such a better perspective. A variety of sources. I love reading industry and non-industry blogs, so I share a lot of those. I also create my own blog posts and share news articles. Basically, if I find it compelling, it made me smile or I think it would be helpful to others, I share it. There isn’t much forethought given to my posts other than that. I genuinely don’t know, but my guess is that it would be my blog post that I shared when I took my current position at BHGRE | Go Realty. This blog was written straight from my heart, and my feelings poured out on the page. It is me sharing my story in a very human way, which people like reading about. Would you like to participate in our social media profile series? Email contributors@inman.com.